Swifts’ feet and legs are so small they can’t even walk! But they can hang. Vaux’s Swifts are perfectly adapted to lives spent in the air. They mate on the wing, and their feet and legs are so small they can’t even walk. But they can hang. So at dusk they collect along the inner walls of giant chimneys, at places like Chapman Elementary School in Portland, Oregon. Portland Audubon and the local community organized and raised money to save their neighborhood chimney — and their swifts. Support for Birdnote comes from Audubon Park Wild Bird Food, welcoming autumn with full feeders. Fall bird feeding tips at Audubonpark.com. You’re hearing the sound of eleven thousand Vaux’s Swifts on a stopover during their fall migration. They’re diving in and out of the chimney at Chapman Elementary School in Portland, Oregon. The swifts gather together, forming great clouds as they prepare to roost for the night. The birds swirl in perfect harmony, somehow never touching each other. Swifts are slim, torpedo-like birds, perfectly adapted to lives spent in the air. They mate on the wing, and their feet and legs are so small they can’t even walk. But they can hang. 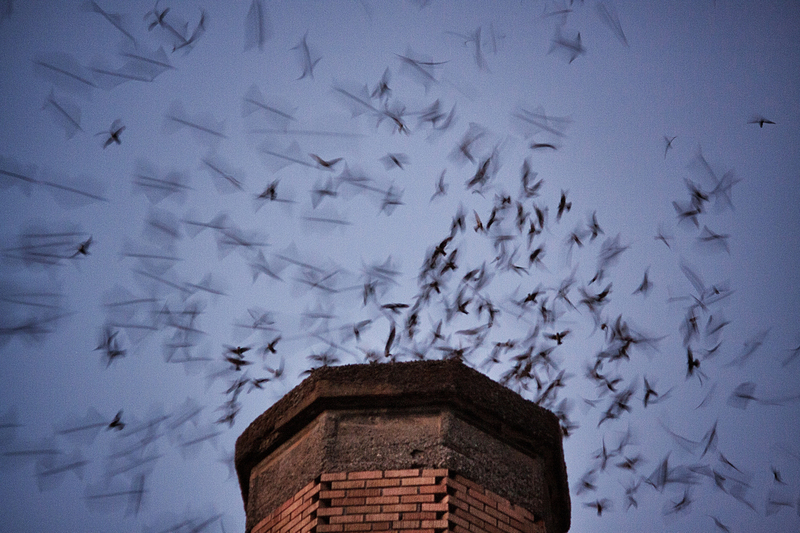 So at dusk they gather, diving into the chimney. The birds collect along the inner walls, tiny bodies pressed together, awaiting the dawn. Swifts used to rely on old, hollowed-out trees for their roosts. As those trees were cut down, the birds adapted. But now chimneys are threatened, too. We just don’t build great big brick chimneys anymore. And many older chimneys are being lost to redevelopment. Here at the Chapman School, Portland Audubon and the community organized and raised money to save their neighborhood chimney. They love their swifts. Watch a video of migrating swifts at Chapman School at our website: Bird Note Dot Org. With special thanks to Gordon Orians. Vaux’s Swifts and crowd at Chapman School recorded by Jason Saul for BirdNote. Video recorded by Clint Durrett. Vaux's Swifts gather in Monroe, WA, too! Chimney Swifts are gathering in the Midwest, South, and East! 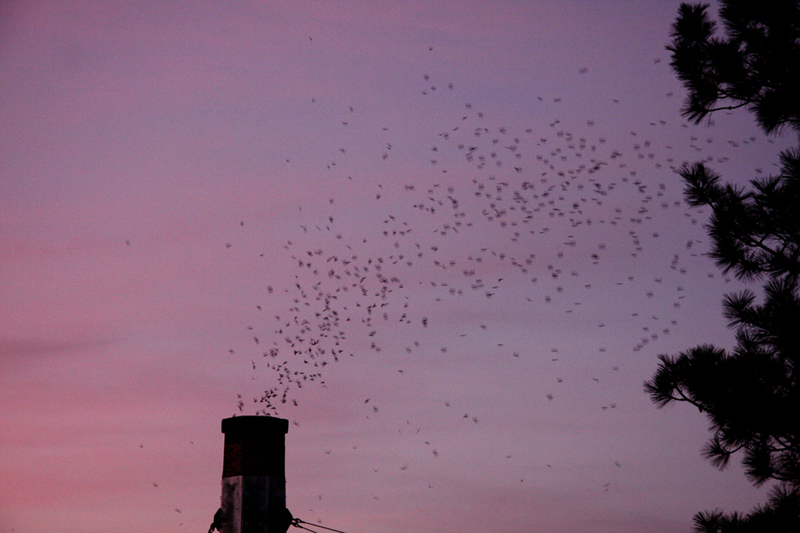 Thousands of Vaux's Swifts entering chimney!